Every WCM platform strives for a spot on the Gartner Magic Quadrant for WCM, whether that is in the Leaders, Challengers, Visionaries or Niche Player aspects judged on their completeness of vision and ability to execute that vision. 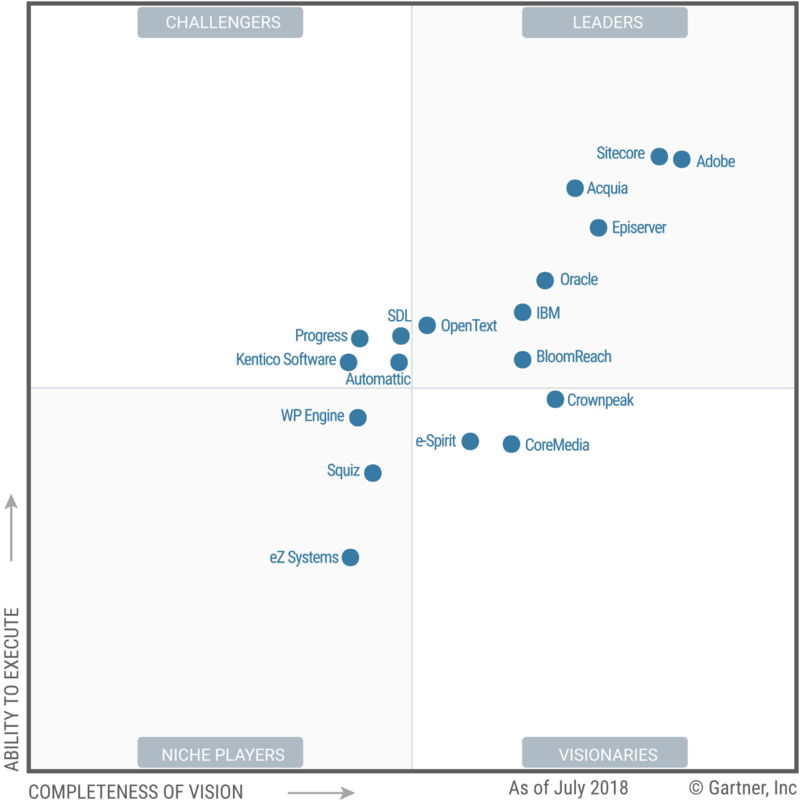 And according to the Magic Quadrant survey the EXLRT products SDL and Kentico ranked high among the ‘Challengers’ while Sitecore and Episerver took spots next to the WCM ‘Leaders’ that are driving market transformation. Here are a few of the reasons why each of these WCM platforms earned a space in the Magic Quadrant for 2018. SDL Tridion Sites is made for organizations that require global content creation, translation and delivery across many sites. The technical capabilities, architectural constructs and process-level guidance will help businesses take their digital presence to the global level. The combination of SDL Tridion Sites for web content and SDL Tridion Docs for structured content with built in SDL Language Technology and translation services that makes up the larger SDL Tridion DX Portfolio has potential to dismantle information silos with unified delivery of marketing and product content to create a better digital experience. SDL's global capability, along with an expanding partner network, is enabling it to make progress in emerging markets for WCM, such as Japan. SDL not only scored well on the Gartner Magic Quadrant, it was also recognized as a Leader in the The Ovum Decision Matrix: Selecting a Web Experience Management Solution, 2018-19. According to the report, SDL Tridion DX outperforms the vendor averages for core capabilities, architecture and administration, integration, cloud capabilities, DAM and interoperability. SDL’s headless architecture and combination of WEM and translation software also drives extra opportunities for growing numbers of businesses. Kentico's EMS offers native, built-in digital experience management functionality, with basic DAM support, workflows, online communities, analytics, e-commerce and online marketing alongside its core WCM functionality. Kentico's competitive and clearly defined pricing appeals to midsize organizations and larger enterprises slowly starting to invest in digital transformation because it offers a good ROI. Kentico is a good match for midsize organizations due to comparatively low entry-level pricing, comprehensive native capability, and ease of use for business and IT professionals. The ‘Leaders’ of the Magic Quadrant have the highest combined scores for their Ability to Execute and Completeness of Vision. As Episerver and Sitecore are included among the ‘Leaders’ this means they are able to demonstrate enterprise deployments, offer integration with other business applications and support various vertical and horizontal contexts. Episerver offers a broad business-savvy product portfolio across content management, digital marketing and digital commerce. Episerver is well regarded for usability by customers across IT and business. Advanced experience management capabilities, such as event triggering, AI-based personalization, and customer journey analytics are incorporated into typical WCM processes that don’t require specialized expertise. Sitecore: A popular platform that has been an industry leader for nine years appears frequently on Gartner reports and scored the highest in their WCM evaluation categories. Sitecore's architecture offers “headless" capabilities in the interests of cross-channel capability and general content agility while also retaining business-logic-level capabilities such as advanced personalization, contextualization and content preview. Sitecore offers training and best-practice programs to ensure clients can put new features to effective use. Customers of other WCM systems often spend a lot on features they rarely use. Knowing that your company and team members fully stand behind the products you supply is encouraging, but when all four of your supplied WCM software programs rank among the best according to the latest Gartner survey, that’s something to be proud of.